I have thought about guest bloggers…I know so many good cooks. I finally took action and asked Craig Boroughf. Craig has shared his recipes before, French Breakfast Radishes and Carmen’s Prize Winning Meatballs…thank you Craig for being my first guest blogger. The words and photography that follow are a gift from one of my favorite chefs, Craig Boroughf. You’ll find these two colorful gentlemen, accompanied by a nearly a dozen ice sculptures , on Central Avenue in Highland Park. 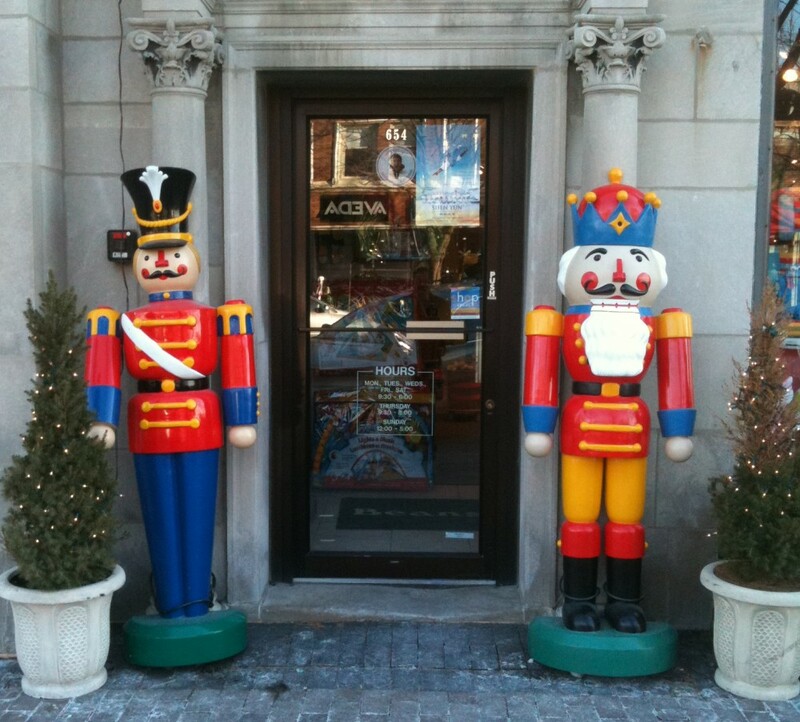 Nattily attired in their holiday garb they signal a warm welcome to all who pass by. To slightly crush whole fennel seeds, place in heavy duty zip-lock bag and pound with rolling pin or meat tenderize. This recipe can be prepared one week ahead. Line heavy baking sheet with foil; top with Silpat baking mat. If not using Silpat, line baking sheet with non-stick aluminum foil. 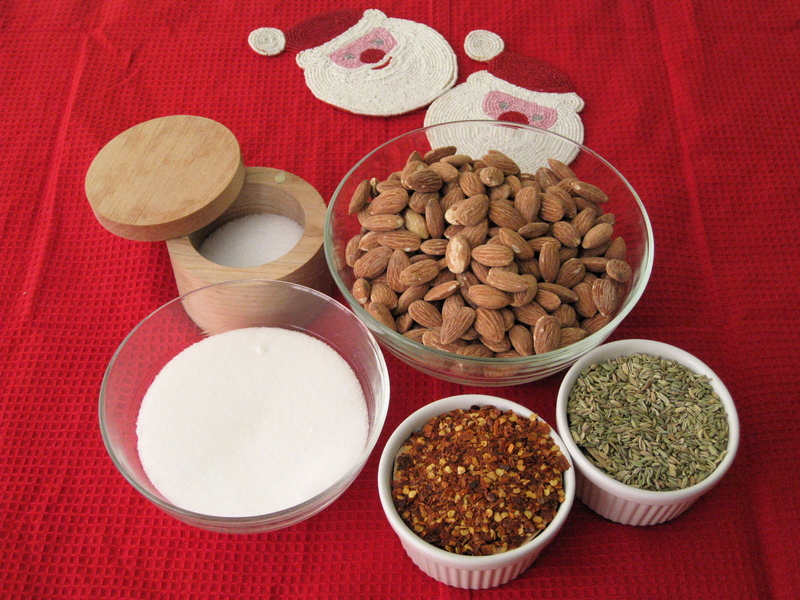 Combine all ingredients (sugar, fennel seeds, crushed red pepper, salt, almonds and water) in medium bowl. 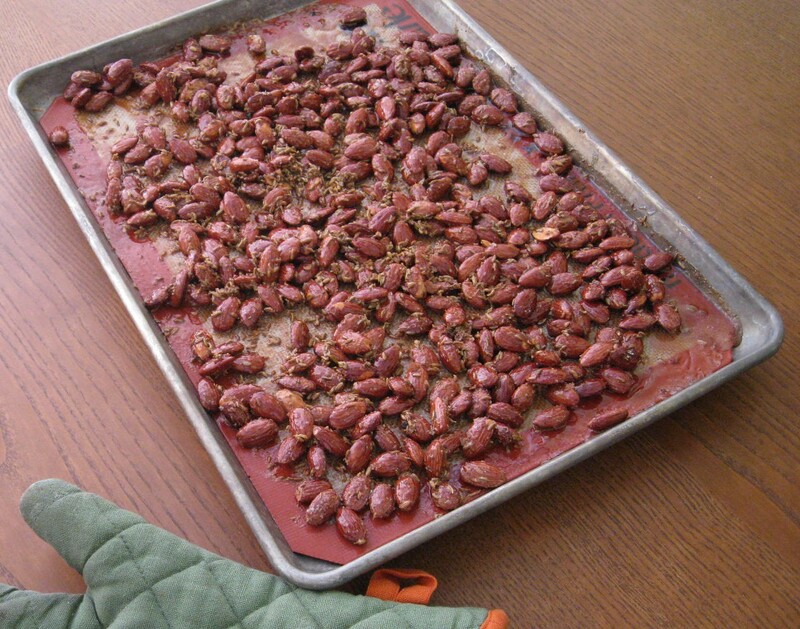 Spread mixture on prepared baking sheet in single layer. Bake until sugar melts and almonds are deep golden brown and glazed, stirring twice; 45 to 50 minutes. Cool completely on sheet. 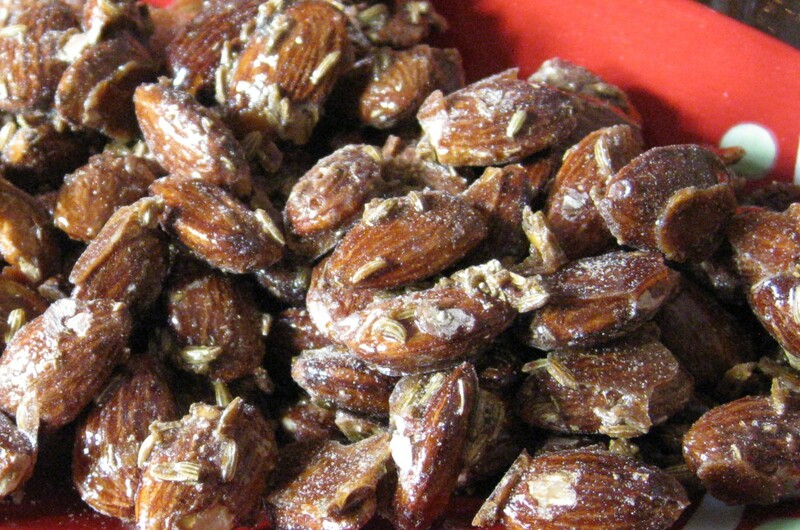 Almonds should resemble a very thin almond brittle. Break/separate almonds apart. (Can be prepared 1 week ahead. Store in plastic bag.) 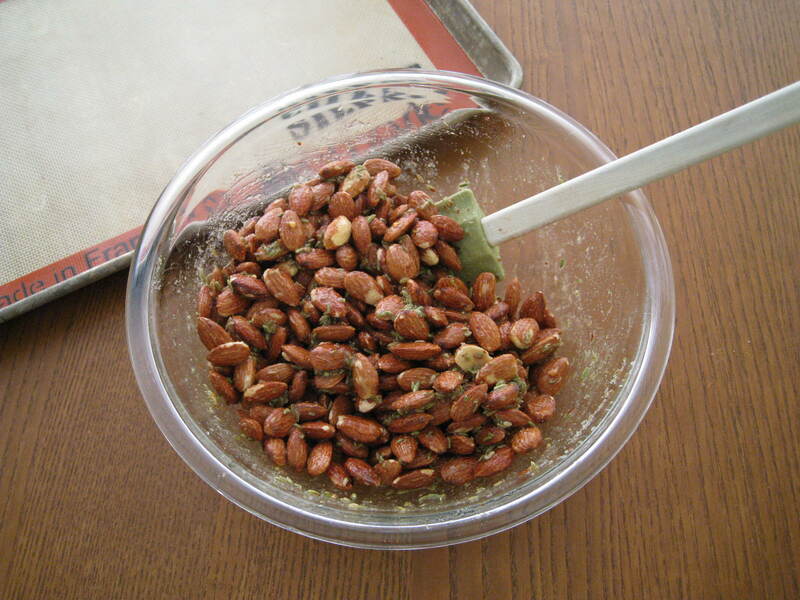 Transfer almonds to bowl and serve. Tips: If almonds stick together, which always happens to me, place large pieces of the almonds in a large heavy-duty ziploc freezer bag. Break almonds apart through bag. 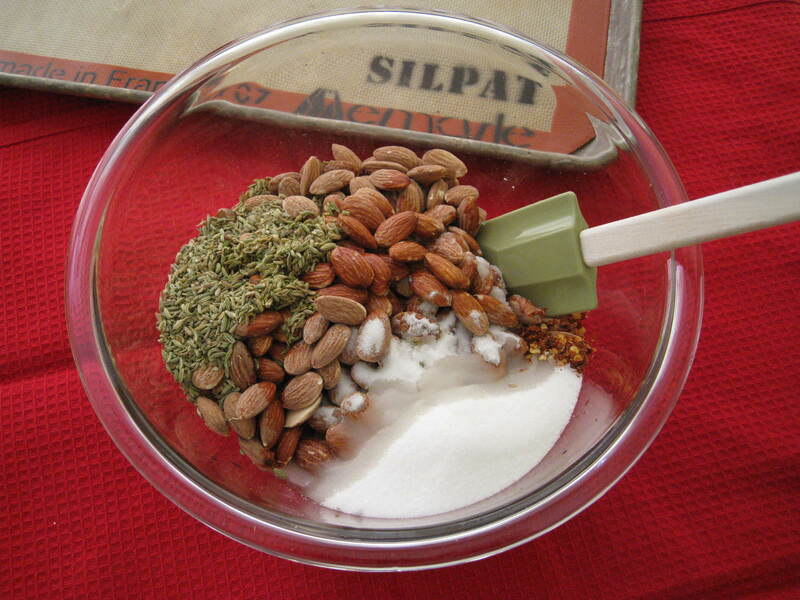 This will contain the sugar crumbs, etc., that otherwise tend to get very messy. 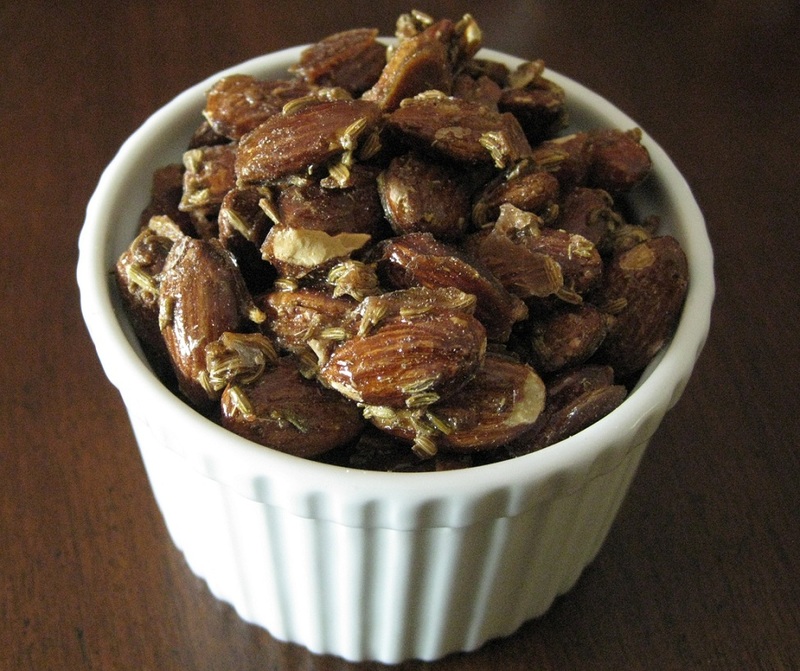 Tags: Cooking for one or a ton, Healthy, Party Appetizer, Photography, Quick and Easy, Recipes, Sweet and Spicy Almonds. Bookmark the permalink. Thanks Adagio! What a privilege. Love you and your blog! Very advenurous spicing of the nuts, especially during the holidays. 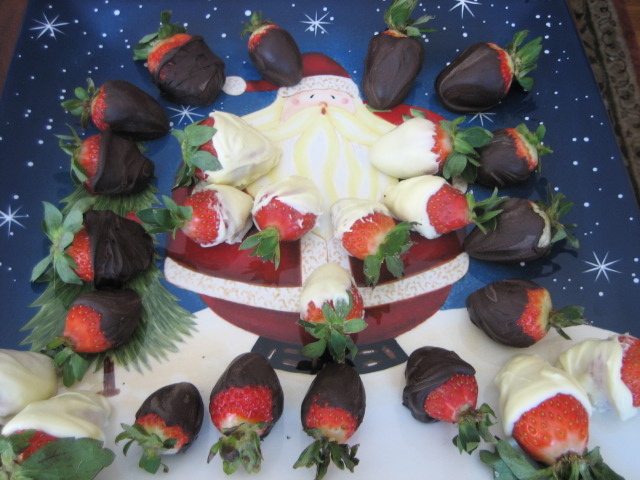 Pairing with wine is a good idea, Something Santa and his helpers will enjoy! 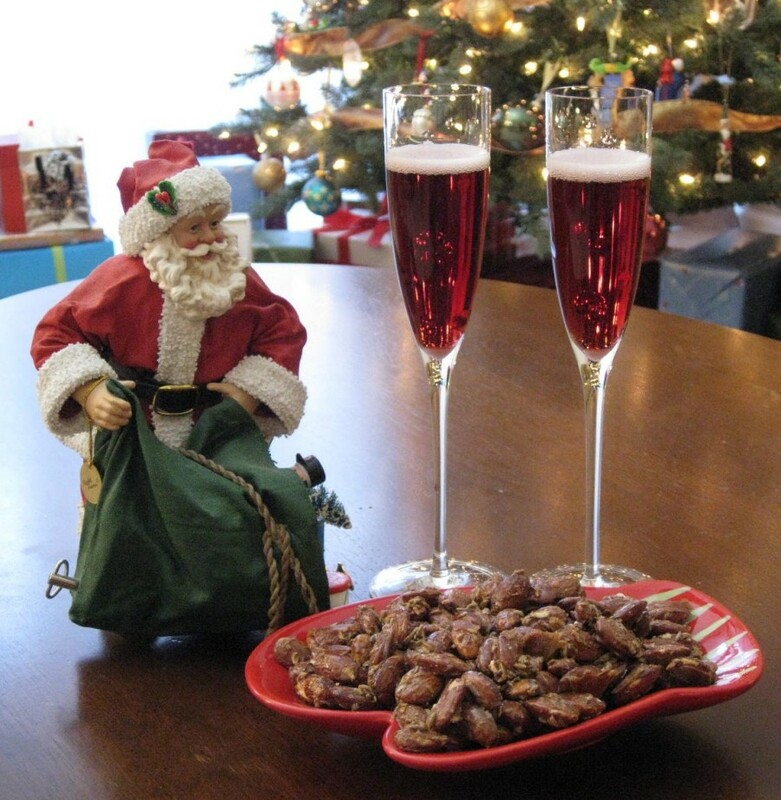 Love the pictures… I’m making this one to bring to my Holiday hosts with a bottle of Red of course! Thanks great blog!! I’m “nuts” about what you and Michele put together. I know from experience that they taste as good as they look! Very cool that you added a celebrity blogger who has mad skillz. Awesomesauce I say.